"Cut the time in half that it takes to send files between computers on the same LAN network with Dukto." Sending files to and receiving files from people at the office can sometimes be a bit of a pain. Until now there hadn’t been many solutions that I’ve come across that just make sense. Sure there are several ways that you can send files between people at the office, but why go through the process: logging into a site or program, waiting for a file to upload – and don’t let it be a large file, because then the wait time is extended – Then you have to wait for the file to be sent over your network to the receiver who then has to download the large file himself/herself; and what if he/she only has to make a few edits and then send it back to you, the sender? It’s just a never-ending loop of unnecessary time consumption. If you could cut the time in half, would you? Connecting directly to the person who is sending you the file makes a lot more sense than going through the process just described above. I’m not talking about grabbing an Ethernet cable and connecting them from one computer to another, that’s just silly. But connecting through an application that simply acts as a bridge in which the data can “drive” across is genius. There’s an application that does just that – and it does it well. It’s called Dukto. 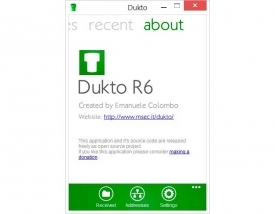 Dukto is a simple file transfer application that allows you to send text, pictures, other files, or folders of files from one computer to another on the same LAN network. This literally cuts the time in half and allows you and your team members to be a lot more productive – twice as productive, technically speaking (do the math: half the time = twice the work). Sending and receiving large files isn’t an issue, unless of course you’re operating on the one of the slowest networks in the world – then at that point, maybe it’s time to start thinking about upgrading the speed in the office, because nobody is going to get any work done on a slow connection. 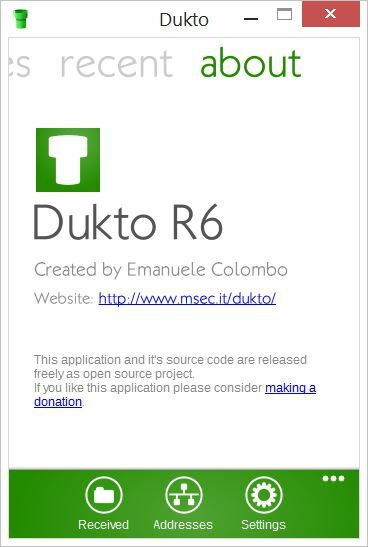 Dukto isn’t the first to do this, I’m sure, but it definitely is the best looking application that I’ve come across of its kind. It has a very Windows Phone-like interface. It’s flat design and bold colors go very far to make it look so sharp and crisp. If you’re not familiar with the Windows Phone look and feel, I urge you to test out this program just so you can get a taste of the interface. It’s customizeable too – well the colors are at least. You can change the color of your application’s interface to any color that you can think of, not just a couple of presets. Do you send files to the same people quite often? No problem! You don’t have to worry about constantly typing in their computer’s name or IP address, just once and Dukto will remember and add them to your “buddy” list. This will save you even more time in the future. 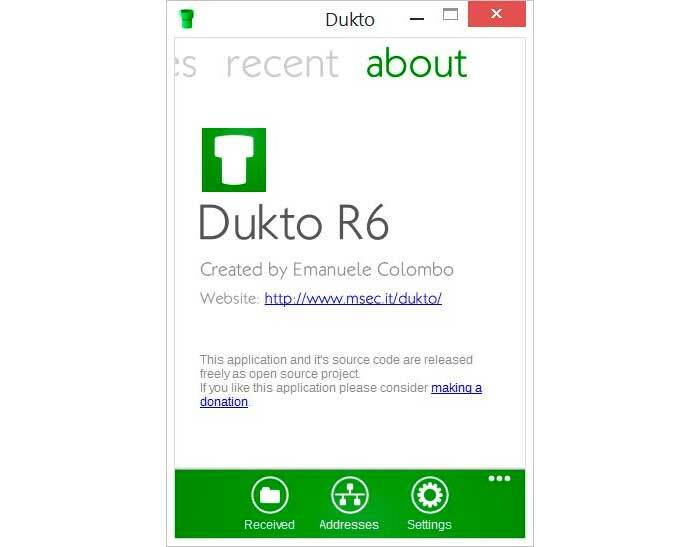 Start saving time with Dukto today!